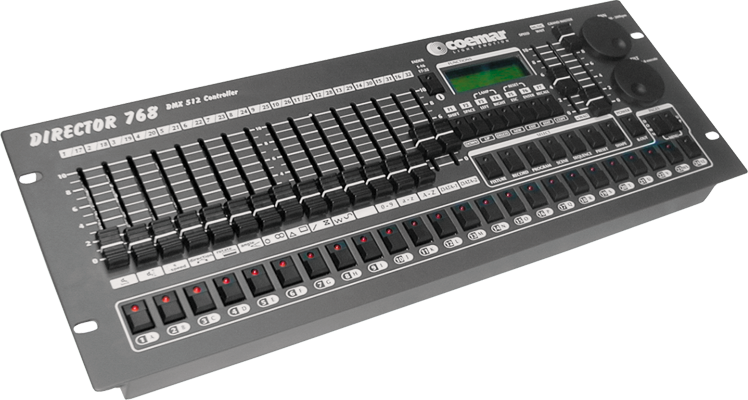 A controller for 24 fixtures, with a maximum of 32 channels each + dimmer (768 total DMX channels). Playback that allows 4 different sequences at the same time. Mater fader to adjust general light intensity, jog wheel for Pan / Tilt control to 16 bit. 2 faders to adjust speed and wait time from 0.3 s to 5 s.
Sequence trigger option: internal clock, manual, audio. Pan / Tilt shape effects. Export, back up or import shows via USB to PC. Built-in Coemar fixtures library (other library can be upload via USB or build directory in the mixer).